3 Bedroom End of Terrace House For Sale in Rotherham for Offers in excess of £165,000. Cul De Sac Position And Larger Than Average Garden To The Rear. Viewing is a must to appreciate this well decorated and appointed, deceptively spacious three bedroom, three storey end town house. The family home benefits from a drive and single garage. Giving access to the M1 motorway network, public transport links and local amenities the property would suit a varied purchaser. 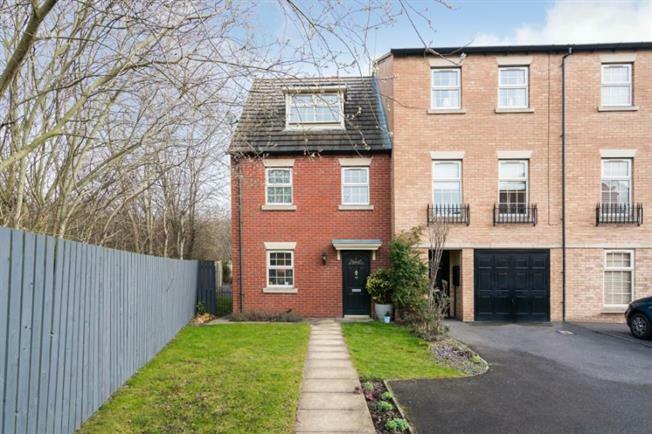 Located on this popular development the property briefly comprises of entrance hall with stairs rising to first floor landing. Cloakroom having a two piece suite. Kitchen having a range of fitted wall and base units having integrated oven, hob and extractor. Lounge having two French style doors to the rear garden. First floor landing two well-proportioned bedrooms and family bathroom. Bathroom having a white three piece suite. From first floor landing stairs rise to second floor landing leading to master bedroom. Master bedroom having en suite shower room. Outside there is a lawn to the front, drive and single garage. To the rear there is a sizeable enclosed garden with lawn and patio.